As 2018 draws to a close, it’s a time when many of us reflect on our accomplishments over the past year and set plans for the new one. At UAMMI we have done the same. 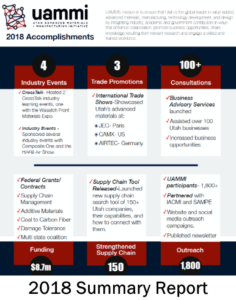 We have taken stock of the activities we accomplished this past year, with the help of so many in our industry, and compiled them into a summary report. For all of our supporters, stakeholders, and partners, this summary will display the outcomes of your support. Events– Sponsored and hosted two CrossTalk conference events which brought together industry experts and attendees for a day of learning. Both of these were in partnership with the Utah SAMPE Chapter’s including the annual Wasatch Front Materials Expo last spring. Events– Participated in and exhibited at the first ‘Stem-City’ event at the Hill Air Force Base air show, which helped educate Utah children (and their parents) about this industry. Industry Presence– Showcased Utah’s advanced materials industry at the leading trade shows including JEC, CAMX, AIRTEC. 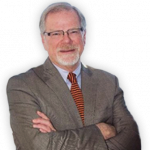 Specific Business Consultation– Initiated our business consultation services to help individual companies achieve greater success. Assisted some 100 companies. Grant Funding– Awarded a federal research contract to explore carbon fiber additive manufacturing for the Air Force. Installed Utah’s first carbon-fiber 3D printer. Development– Launched the supply chain database tool which allows all interested parties to find, connect into and do business with Utah companies. Industry Outreach– Continued outreach efforts through our website, social media and newsletter campaigns to our nearly 2000 subscribers.